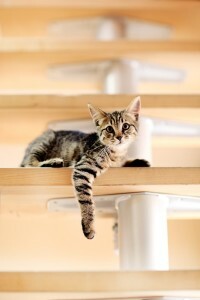 We are a business devoted to providing care to cats and their families in this community. We will serve as advocates for the cat in the recognition of health versus disease and the prevention and relief of distress and suffering. We recognize that euthanasia is one of the tools we use to achieve this goal. We will recognize the needs of families who bring us cats and respect the emotional bond with their pets, the trust they give us, the private issues that they may share with us, and differing economic situations of each family. We will make education of clients a priority. We will serve the community by assisting in the care of free-roaming cats and cats living with indigent people. We will assist the efforts of humane organizations whose values align with ours. We will practice medicine in a way that conserves resources and protects human health by controlling zoonotic disease and being good stewards in the prescribing of antibiotics. We will adopt practices that conserve energy and material resources and limit waste. We will adopt good business practices that allow us to earn a fair profit to support the staff and reinvest in growth of the practice. We will treat our coworkers with respect and resolve conflicts in a direct and above-board fashion. We will balance the needs of our patients, clients, business, and coworkers. If we find that a single member of any of these groups is jeopardizing our mission, we may elect to remove that individual from the practice. Recognizing both physical and behavioral pain is a strong priority. Our animal handling and treatment plans will minimize both types of pain. We strongly discourage declawing and will require that alternatives be explored and given a trial. We will educate clients on providing environmental enrichment. I do not support either the unrestricted free-roaming of owned cats or the 100 % indoor confinement of cats. I believe all cats benefit from protected access to the outdoor world, whether that be supervised outdoor access, cat enclosures, screened porches, and balconies, or leash-walking. I support the keeping of working cats in agricultural settings where the cat is provided a safe retreat such as a workshop or feed room and supplemental nutrition. I support trap-neuter-return as a rational approach to free-living cat management in selected environments. We believe all cats should be microchipped. We will check all our patients for microchips and assist clients with keeping registration current. We will encourage the use of reflective breakaway collars with identification in addition. We will be vigilant for signs of animal abuse and report it to the Humane Investigator for the county or city of residence. If we have observations or information that persons in the same household may be victims of abuse or neglect or in fear of it, we will provide information about resources in the community such as the Women’s Crisis Center. Knowing that adult victims of abuse often fear for their pets should they leave, we will advise that Boone Country shelter and many other jurisdictions have emergency pet sheltering available. If we have reason to believe that a child is being abused or neglected, we will report it to the police in the appropriate county or town. We will respect the basic privacy of our clients, but acknowledge that domestic violence thrives on secrets that we are not going to keep. We believe cats benefit from protection from contagious disease via vaccination and support the AAFP vaccination guidelines. We do not endorse the feeding of raw food diets prepared by humans. If cats hunt and consume prey, they should be dewormed 2-4 times a year to prevent zoonotic transmission of parasites. • Good time management and work habits to allow separation of work and home life. • Maintenance of personal health through exercise, nutrition, adequate sleep, and attention to personal health needs. • Restoration of personal energy through time spent in contact with the natural world, exposure to the arts, and creative ventures. • Maintenance of an introspective routine: reflection by discussing issues with a confidant, keeping a journal, and/or spiritual practices. • Personal growth through education and maintenance of social relationships.